Katherine McCarthy Author: Release Day for Invisible Victims: Missing & Murdered Indigenous Women!!! 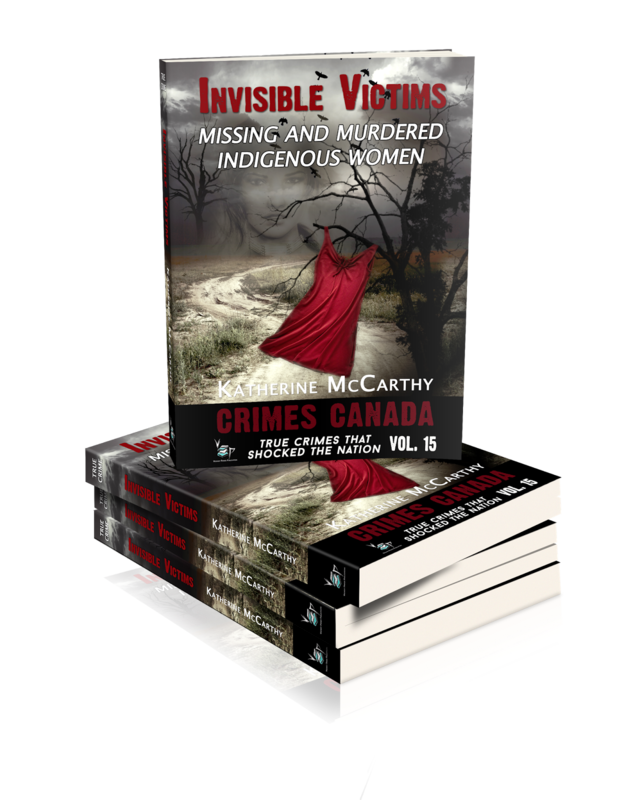 Release Day for Invisible Victims: Missing & Murdered Indigenous Women!!! The day is finally here! I'm so pleased and honored to share with you my debut true history about the Missing & Murdered Indigenous Women Crisis in Canada. I spent the better part of a year researching and writing this account. As a woman, I found it very disturbing to discover this was happening in our country. As an indigenous woman, I was horrified. I was compelled to delve deep into the issue to really understand the root causes as to why this was happening. It's a dark history yet a very important one to share. My sole intention in writing this account is to help raise awareness and hopefully help others understand the injustices Indigenous people have and still are encountering. The purchase links are included below but here is an excerpt for you to get a sense of what the book is about. Poison comes in many forms. For the Indigenous women of Canada, it comes in the form of disproportionate rates of violence, racism and discrimination. In recent months, one has only to turn on the news, open Facebook or Twitter to see or hear about the national crisis, Murdered and Missing Indigenous Women (MMIW) of Canada, or the fact that Indigenous women and girls are at a higher risk of being victims of violence than non-Indigenous women. However, this was not always the case. For several decades, it was Canada's dirty little secret. On the world stage, Canada has always touted itself as an openminded country that celebrates diversity and multiculturalism. It has always been viewed as one of the most culturally tolerant countries in the world, with the friendliest and nicest people. Yet in reality, Canada has a worse racism problem than many countries. It’s just harder to see. The day I heard about the murder of Loretta Saunders, an Inuk woman from Labrador, was the day I became aware of the MMIW crisis in Canada. The news reports spoke of her pursuing a Master's degree in Social Work from St. Mary's University in Halifax and that she was writing her thesis on this crisis. I remember a momentary confusion wondering what the MMIW crisis was all about and why was I not aware of it. Was it a large enough problem that someone was writing a thesis paper on it? And if it was indeed a 'crisis', why was it not plastered over the news for all Canadians to hear about? After all, women and girls were disappearing in this country. Women should be aware of it so they could take the necessary precautions. Law enforcement should be advising the public to be careful. I struggled to get my head around the fact that there was little to no mention of this crisis in the mainstream media. That was the day I began my research into MMIW and also the day that the love and pride I felt for my country began to splinter. Words that never before crossed my lips are now common speak - systemic racism, marginalization, colonialism, intergenerational trauma, to list a few. Words that are so inherently frightening they shouldn't have to be used very often, let alone every day. Up to that point, I was always proud to be a Canadian. Maybe a little pompous even for being from such a great country that didn't have the same social problems that plague other countries. But now after my research for this book, I realize Canada too has significant societal issues. Violence against women is at a breaking point. Our society is at a breaking point. Crimes against Indigenous women and girls are all too real and are happening every day. Our news is filled with inconceivable violent acts towards women. This book seeks to shine a spotlight on Canada's national MMIW crisis. With the aid of specific MMIW cases, I'll attempt to demonstrate how Indigenous women have become so devalued in society that neither the media, law enforcement, or society in general is even noticing that Indigenous women have become the most victimized group in Canada. While every single MMIW case is deserving of its own book, sadly I could only select a few to discuss here. This work also delves into the root causes of this crisis through discussions of the various policies and programs initiated in Canada that have sought to marginalize, disassociate and assimilate Indigenous people in Canada – each one a crime against humanity in and of itself. For centuries, bureaucrats have been open and honest about their intentions to "kill the Indian in the child" and to "eliminate the Indian problem." And, yes, those phrases are in quotations because someone actually said them. Duncan Campbell Scott, the first Deputy of Indian Affairs in Canada, heartlessly uttered both in parliament meetings. I don't believe the general public is aware of just how far those bureaucrats went to achieve those goals. I would hope they would be outraged if they did know. It is also my belief that the main reason for such policies was to reduce the number of those to whom the federal government has obligations and to gain access to lands and resources. Our government needs to be held accountable for the genocidal policies and practices it has imposed on our Indigenous people for far too long. This book is in no way an attempt to guilt non-Indigenous people. Rather it is a way to educate and inform readers about how much the Indigenous people, women specifically, have lost. It's my way to help bring awareness and hopefully some understanding and compassion to the MMIW crisis. Some will say that it all happened ages ago and it's time to 'get over it.' Yet sadly, it wasn't that long ago that these programs designed with genocide in mind were in place. The last residential school didn't close its doors until 1996. That was the year I graduated from the university. More information about the residential school system and some of the other programs will be discussed later in the book; however, I just want to mention here that the effects of those systems are multi-generational and will take generations more to fix. Today, Indigenous children are still abused under provincial Child Protective Services programs, and Indigenous women are still going missing and are violently murdered at astronomical rates. Most importantly, my intention with writing this book is to help my Indigenous sisters and brothers to heal. We all know grief. And we all know far too well that healing only begins through talking. Problems like this do not begin to be resolved until enough people are talking about it and it reaches a breaking point. I believe the 2014 murder of Loretta Saunders mentioned above and the coldblooded murder of 15-year-old Tina Fontaine in Manitoba was that breaking point. Their horrific murders made headlines, ignited widespread outrage across Canada, and finally brought this crisis to the general public's eyes and ears. With the new Liberal government elected in late 2015, one of the first actions initiated by our new Prime Minister, Justin Trudeau, was to commit to undertake a national inquiry into MMIW of Canada. Government officials have met with many families of the victims across Canada to get their input into the design of the inquiry. While not ideally initiated, the government has done what it said it was going to do, and hopes are high that we will get some answers and good recommendations for a solution. The national inquiry, if done correctly, should expose all of Canada's dark secrets relating to this tragedy. When asked by my publisher to list what I considered the most shocking true crimes in Canada for this series, my number one on the list was the MMIW crisis. It honored me to be asked to write it. Throughout my writing of this book, I have tried to remain as neutral as possible. However, being a female of Mi'kmaq descent, I would be less than honest if I didn't admit to at times failing to remain completely objective – especially if discussing particularly brutal deaths or the apathy of our law enforcement and media. These women and girls are real people that are being murdered and are going missing, and not just numbers or cases. Finally, there are various terms used all over the world when discussing Indigenous peoples. In Canada, the proper term is "Indigenous" and I will try and stick to that one as much as possible. Although you may see "Aboriginal" or "First Nations" as well, for my purposes, they mean the same thing. The term "Indian" will only be used if it's a direct quote. Also, in Canada, the term for Indigenous communities is "reserve", whereas in the US, the term commonly used is "reservation." These both have the same meaning.